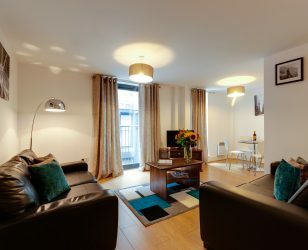 Our largest site, Base operate a variety of 1, 2 & 3 bedroom serviced apartments at this location. For a luxurious stay, opt for a penthouse with breath taking city views. 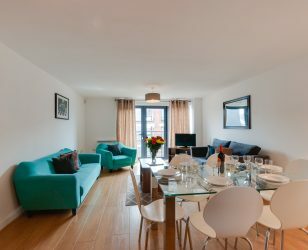 All serviced apartments feature stylish well-equipped kitchens with laundry facilities, along with widescreen TV’s and living spaces. 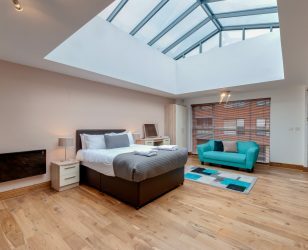 With bespoke, contemporary interiors our apartments offer the perfect place to unwind for families, leisure and corporate guests alike. 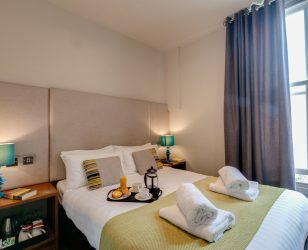 Travelling to Base is easy, check in is just a 10-minute walk from Lime Street station and secure on-site parking is available on a first come first serve basis. Great position close to the city centre attractions and shops. We stayed over a 3 day, 2 night weekend in September 2017. The reason for our stay was a visit to the annual Psychfest held in the Camp & Furnace near to the apartment. We had a second floor apartment overlooking a side street so there was no noise from the main road. The reception process was quick, efficient and friendly. The apartment was well kitted out and very clean. We will definitely think of staying at Base for next year’s Psychfest ! 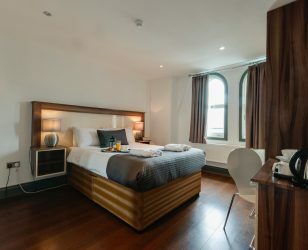 Stayed in the Duke Street apartments (7H) Great location to the town centre and Anglican Cathedral is a matter of yards away. Lovely apartment with everything you could want we stayed in a two bedroom apartment overlooking Duke street and it was lovely seeing what was going on. No noise from restaurants below and so quiet within the block. The only issue was the entrance to the car park was tight if you have a big car as we had, but once in it was ok. The apartment was very clean and shower etc were great. We ate out but you could have cooked as all amenities available in the kitchen. Would definitely stay again. Couldn’t have asked for anything more. 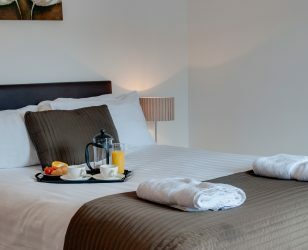 Loads of space, clean, towels, very comfy beds and everything you would need to make a decent meal if you decided to stay in. Great value for money and meant the family could be together but also have their own space. Stayed in an apartment on Duke St and so close to loads of great cafes, restaurants and bars. Only 10 minutes walk to Albert Dock and museums, etc. Stayed here with my 3 sons – 2 teens & a 10year old as having discovered it is WAY better to stay at an apt when you have kids with you so everyone has their space. 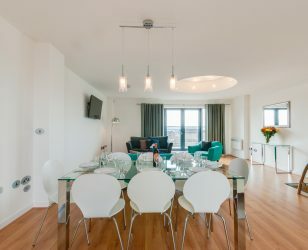 The PENTHOUSE apt was very reasonable for what you get – 2 good bedrooms, a large bathroom with bath & shower and an ensuite as well on the entry level, then upstairs to a very modern open-plan living area with kitchen, dining & lounging area. A mix of leather & fabric couches, large flat screen tv (which was great as usually, apts tend to have small TVs I’ve found), fully equipped kitchen with enough tea, coffee and milk supplies for a day or two. Modern decor, good comfortable beds & pillows, and spotlessly clean. Reception staff are smiley and friendly and very accommodating. Apts are very well situated, a straight 10min walk to John Lewis in Liverpool One – so handy! Also, there are good but not too expensive restaurants on the same street, along with bars and cafes too. I have to say what a brilliant alternative to a hotel stays. Base apartments were attentive, friendly and welcoming. One side you have a Mexican restaurant and the other Japanese Teppanyaki. 10/15 minutes walk from Liverpool One shopping and eating. Great value for money for our family stay, and everything provided as you would find in a hotel but with the benefit of self-catering! Will definitely stay again and can recommend to others. What’s stopping you? We had a lovely 2 bedroom/2 bathroom apartment at BASE Hudson Gardens for our recent stay in Liverpool. 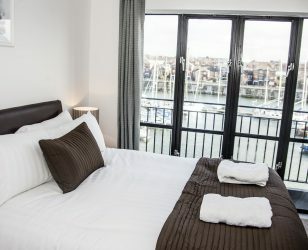 I would highly recommend these apartments if you prefer more room to move around in than hotel rooms and you want the flexibility of fridge/freezer and kitchen to allow for some self-catering. The location is brilliant for all the amenities around Liverpool and there are some great restaurants and pubs within easy walking distance. 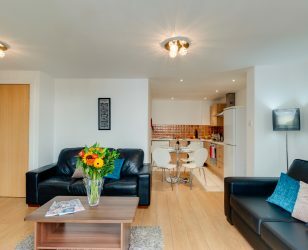 The apartment was immaculately clean, very well furnished and the Reception staff we met were fantastic. Chloe, in particular, couldn’t have been more helpful – which definitely contributed to us having a great time. Very much home from home. Thank you BASE and Chloe – we’ll definitely be back! Highly recommend base. The team in the office were very helpful. We wanted to check in early just to collect keys etc as we would not be back before 11 pm and they said this was no problem. The apartment is very well situated and very nice with an excellent Mexican restaurant in the complex. Also, the apartment is very well placed and central for all your city based activities. Our 3rd time staying at Base Serviced Apartments – 1st time at Hudson Gardens in Duke Street. Once again 1st class accommodation in a superb location. 5 min walk from Home Bargains and Tesco and all the shops, pubs and restaurants. 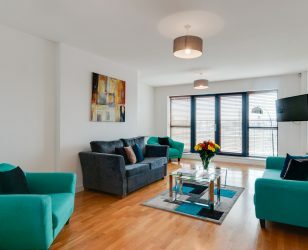 The apartments have everything you need – we stayed in a 2-bed apartment with sofa bed in the living area fit 5 of us comfortably with a wee balcony – great for people watching and chilling! Now with wifi so we had everything we could possibly want. Staff as always 1st class – so friendly and helpful – you never let us down, can’t wait t0 return again next year. The weather was superb and the city as always delivered everything we wanted. You did not let us down Liverpool until next year – can’t wait!!! The two bedroom apartments with sofa bed in the sitting area are perfect for a group. All the rooms are a good size and well-appointed, The kitchen is also well-equipped. The location is great – in easy reach of both the city centre and the university – with a great bar in the parallel street. Location in Duke Street is close to centre, Liverpool One and Lime Street. All are a short walk away. Apartments are decently sized, with comfortable bedrooms, well equipped kitchen, and spacious living area. We stayed in a large flat that sleeps 8 with family. The flat was beautiful , very clean, very comfortable and loads of space for all of us . The service from reception was excellent very helpful and very friendly . We will definitely be returning to base flats and would highly recommend them to everyone ! I spent 2 weeks on Base (Duke St.), flat 31. Very nice 2 bedrooms flat, fully fitted kitchen, TV, 2 bathrooms, dinner and TV room. Just returned home from a four-day stay at Base apartments. We checked in and the receptionist was very courteous and professional. Check in was very efficient, the lady ( sorry I forgot her name ) even offered us advice on the tourist attractions to see in Liverpool.We stayed in Liberty Place, apt 43, it was very clean and spacious and a great homely feeling to it. It was an ideal base for us as we looked up relatives and shopped until we dropped. It was very quiet at night and an ideal place for peace, and had a great night sleep. The area seems to be a student quarter with several colleges around, although we were only 10 min walk to Liverpool one centre. Well done Base apartments, we will be back.